President of Azerbaijan Ilham Aliyev and President of Armenia Serzh Sargsyan had phone talks with Russian President Vladimir Putin at the initiative of the Russian side, Putin's official website reported Apr. 5. During the phone talks, the sides discussed in details the latest developments in the Nagorno-Karabakh conflict zone. 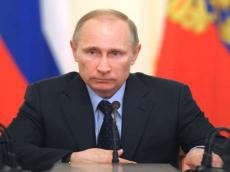 Expressing serious concern over the large-scale armed clashes, which have led to numerous casualties, Putin called on the both sides to urgently ensure a complete cessation of hostilities and observe the ceasefire. It was stressed that Russia is taking and will continue to take the necessary intermediary steps aimed at promoting the normalization of the situation. The parties also stressed the importance of resuming the negotiation process between Baku and Yerevan with the assistance of the OSCE Minsk Group in order to seek the ways for a peaceful settlement of the Nagorno-Karabakh conflict. The presidents agreed to continue contacts in different formats. On the night of April 2, 2016, all the frontier positions of Azerbaijan were subjected to heavy fire from the Armenian side, which used large-caliber weapons, mortars and grenade launchers. The armed clashes resulted in deaths and injuries among the Azerbaijani population. Azerbaijan responded with a counter-attack, which led to liberation of several strategic heights and settlements. More than 370 Armenian soldiers, 12 tanks, 12 armored vehicles and 15 artillery pieces have been destroyed from April 2 until today. Military operations were stopped on the line of contact between Azerbaijani and Armenian armies on Apr. 5 at 12:00 (UTC/GMT + 4 hours) with the consent of the sides, Azerbaijan's Defense Ministry earlier said. The ministry added that Azerbaijan's armed units are now carrying out fortification work in the retaken areas.